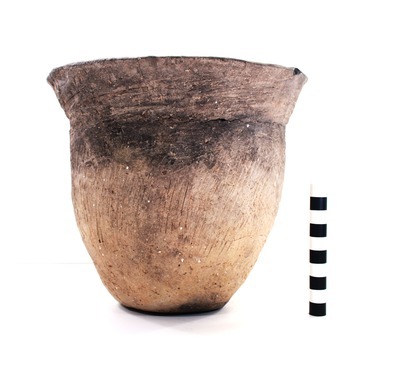 "41HS825, 2003.08.335, Burial 4, Vessel 21" by Timothy K. Perttula and Robert Z. Selden Jr.
DECORATION (INCLUDING MOTIF AND ELEMENTS WHEN APPARENT): The rim is decorated with horizontal brushing marks. The vessel body has vertical to diagonal brushing marks that extend to within 4.0 cm of the base. Bullard Brushed jar, Burial 4, Vessel No. 21, Patton site.